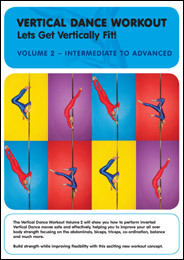 Volume two of a two volume set, this DVD is geared for intermediate to advanced pole dancers. Like volume 1, this DVD includes warm up, stretching and conditioning moves, and also teaches intermediate and advanced pole tricks. This DVD covers Intermediate to advanced pole dance moves. It includes a pole based warm up, cool down, splits techniques and inverted tricks and routines. Never before has a pole dance DVD been constructed in such a way so that it gives you a great workout and the skills to make you an accomplished Vertical Dancer. This DVD has been designed for those with pole dance experience. It features inverted tricks and poses which guarantee to take you to the next level.